We all have at least one in our collections. More than likely we all have a few of them. I'm talking about the ubiquitous test model of course. 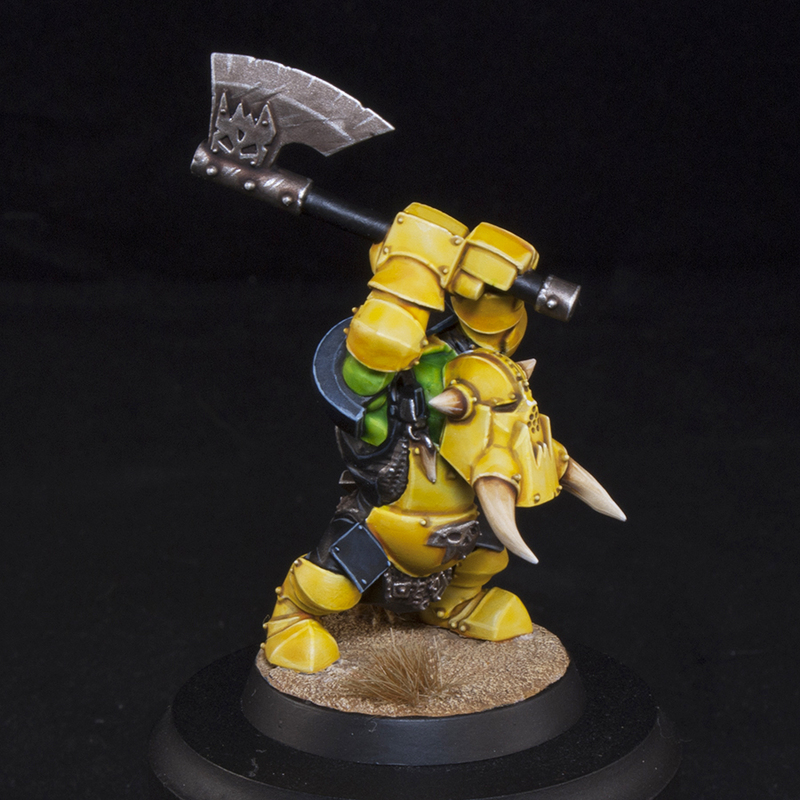 The first mini in a collection to bravely forge ahead into a new color scheme or army. 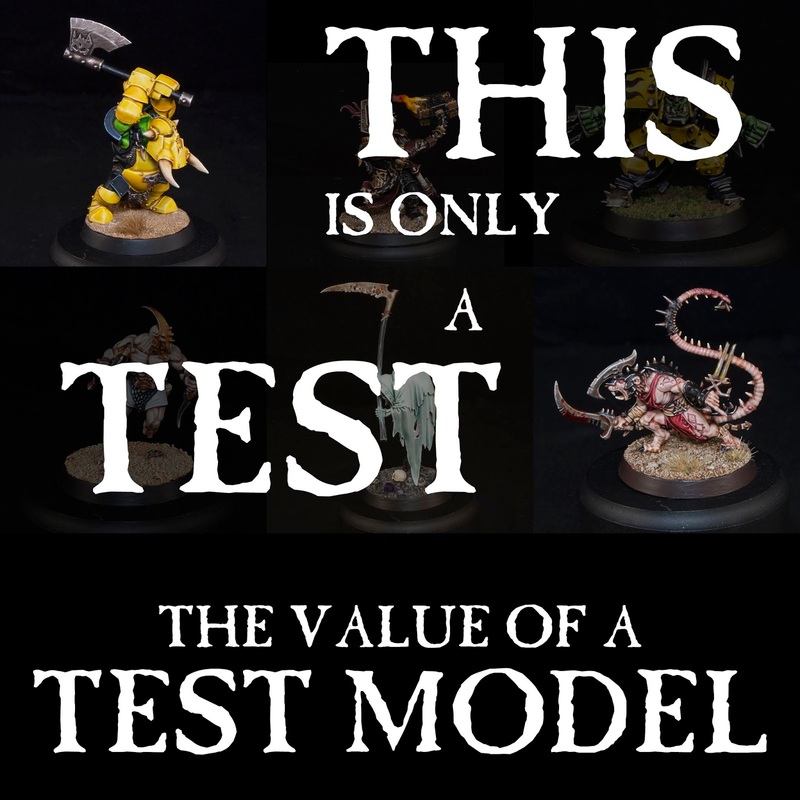 So, why are test miniatures so important to what we do as hobbyists? I'm no stranger to the test model. Pretty much anytime I start a new army or collection I'll paint up one model first to try out the color scheme I'm thinking. This lets you work through any of the kinks that may crop up. It's always a good idea to try out a color scheme on a single model before launching into a whole unit. Better to mess up on one then 10 after all. Usually for a test model I try and pick something that's representative of the bulk of the army. In AoS this is usually a line trooper from a battleline unit. There are a few reasons for going this route. They usually contain little bits of all of the different textures and colors you'll find across the rest of the army, they will be your most numerous model, and most importantly, the rest of your army will be variations on their colors. For me the fact that it represents the most numerous model in your collection is the most important. When I know I'm going to be painting 30 of a certain model or even just doing an army of 50+ models of differing units, I definitely want to make sure I enjoy painting them. There's nothing worse then launching into a new project and getting burned out two units in because you decided they're no fun to paint. Besides being a substantial monetary investment, they're often a huge investment of time and effort. I use to suffer army burn out all the time and either never finished a full army or it took me 4 years to complete. Now I (mostly) complete all of the projects I start (don't look at my Hammers of Sigmar force...). I often also look for a color scheme that's fairly quick to paint. Sometimes I go into a project knowing it'll take a long time and approach it more as a display level force, but often I'm just aiming for high tabletop, which requires them to actually hit the tabletop at some point. This is where I can test out my ideas to see if they'll actually be as quick and easy I think they are in my mind. 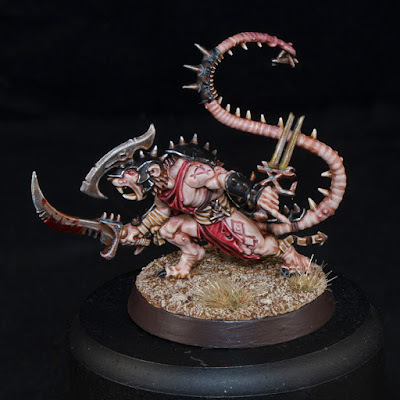 There have a been a few projects where I have changed my mind or backed off of completely after realizing I didn't enjoy painting them as much as I thought I would, or they didn't end up looking the way I envisioned. This is a key time and money saver. These gals started as a test model over a year ago that I just returned to. Sometimes I just paint test models as a break from whatever else I'm working on. Painting a one off model that's a completely different color scheme and miniature type from what you're normally working on can be a nice palate cleanser. This can lead off on army tangents on their own, or they can just stand on their own as a fun model to paint. I have sometimes come back to a test model I painted awhile ago and then expand that off into it's own collection a year or more later. 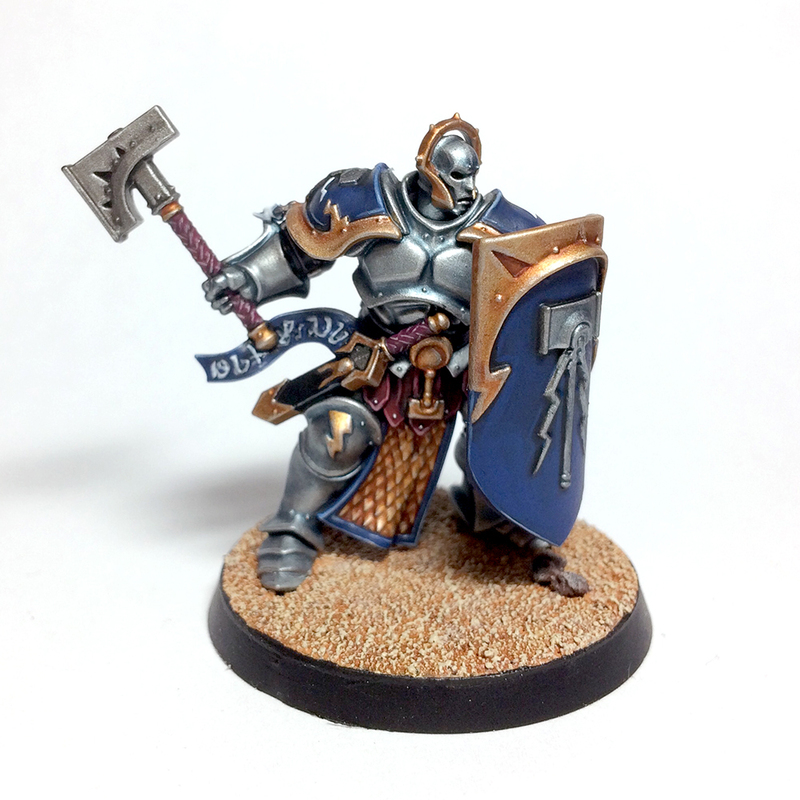 I also have an added benefit of doing test models. They allow me to put together painting tutorials for you on a wider range of armies and unit types then what I'm actually painting for myself! Now's the time for the plug. I have recently started doing a series on social media called Mengel Miniature Tips where I go over random color schemes and tidbits of models in a more condensed fashion then my usual step by step tutorials on here and the Warhammer Community Site. This will allow me to still share paint recipes with you for quick test models, or older models from my collections, or even just a quick refresh of an existing painting tutorial. 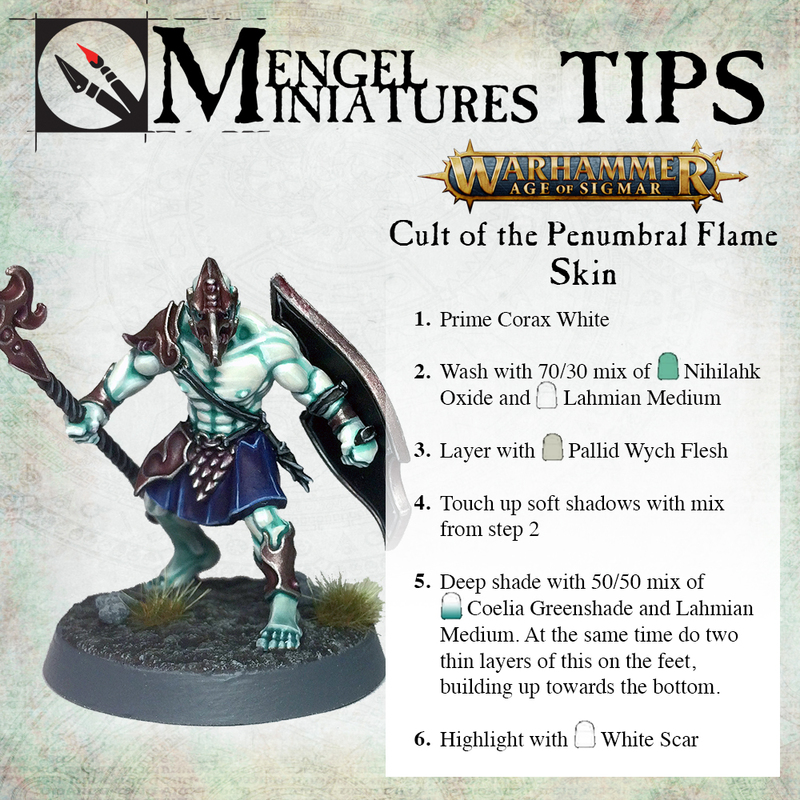 Be sure to follow me on Instagram at mengel_miniatures and /or Twitter @mengelminis. 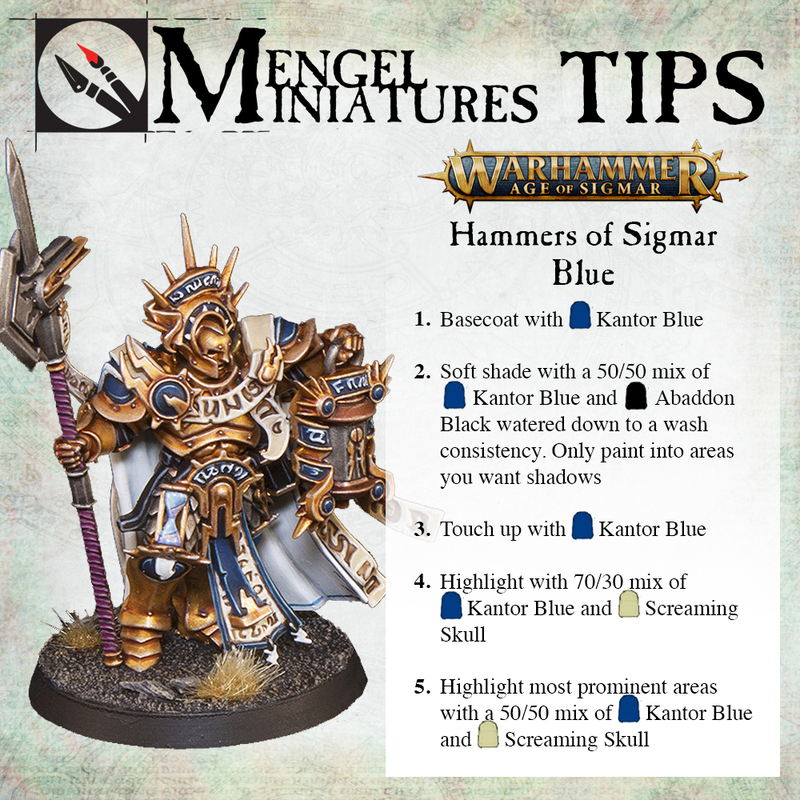 These are the two main channels that I'll be sharing these tips through, though you can also find them in some of the AoS Facebook groups. 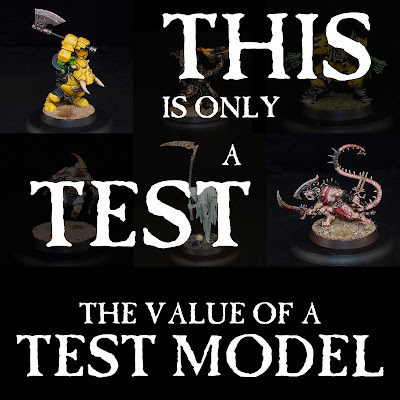 What have been some of your favorite test models? 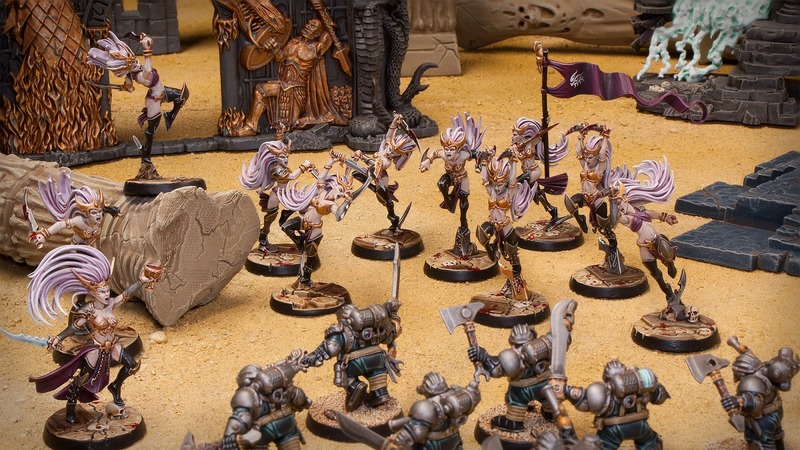 How many test models do you paint before deciding on a project? Let me know in the comments below! Also, Happy Thanksgiving to all of my fellow Americans tomorrow!